It's my Saturday die day today and time for another idea using one of Becca Feeken's newest dies from the Romancing the Swirl Collection. 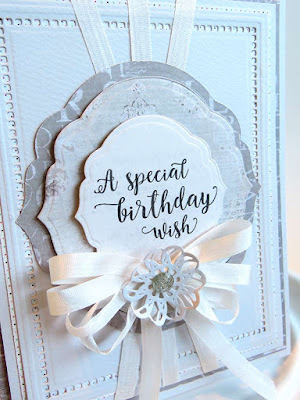 Today i have another fun and easy card to share using a few of my new favorites that are not as swirly but together they make a really pretty and feminine card for a special someone. I started with "Hemstitch Rectangles" for the base and used a few prints but I used them under the rectangle bases just to add a pop of design. This way it's not too overpowering and you can still capture all that beautiful detail in the dies. And then i used the new "Curvy Labels Etched die" over the top and did 3 layers of a muted grey patterned paper set. This gave it a real pretty 3D effect and showed off the dies rather nicely I think. And i added 3 rows of 1/4 inch silk ribbon under the labels and then tied a pretty bow and added it to the bottom of the top label. That tiny little swirl is from the smallest die in the Sweetheart Swirl Etched Die set. It gives it just a pop of pretty without adding a flower to it! And the stamp is from a Penny Black set and i think it goes really well with the swirls of the designs. I stamped that in my favorite black Versafine ink. And now it's ready to send off to a special someone. Hope you liked my inspiration for the new dies today and be sure and check back next week for more fun ideas with the new dies.